You may remember when we told you the secret to the Terrible Turtle Conspiracy (yes, there IS a conspiracy to destroy all mankind – or else to eat the world’s supply of pizza). You may also remember that Jonathan discovered that Audrey Michelle was a part of this conspiracy? Well, now we have something even more shocking to reveal to you…. Yes, our very own Colleen B! 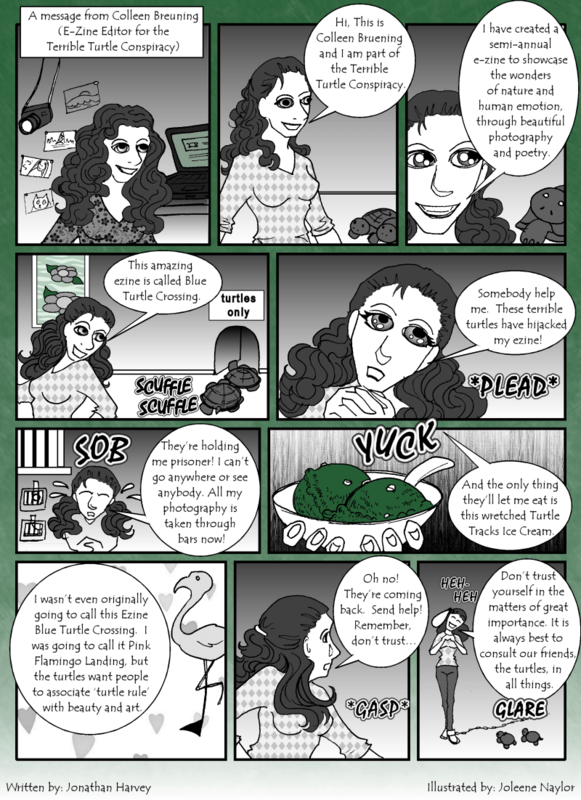 You may know her from Blogophilia, you may know her photography, her poetry, or maybe you remember her amazing E-zine, the Blue Turtle Crossing which sadly ended in 2009– either way, I bet you didn’t know that she is a part of the Terrible Turtle Conspiracy. The question is this: is she really being held captive, or is it just a clever ruse? It does seem pretty genuine, doesn’t it? Jonathan has even started to organize a “Rescue Colleen Association” that has a cool logo and the nifty acronym RCA. What do you mean someone else has that copyrighted already? Moving on, you can rest assured that Jonathan will continue to come up with – I mean uncover members of this Turtle Conspiracy. Perhaps he can even discover WHAT the conspiracy is! I wouldn’t hold my breath on that, though. Colleen Breuning is not only a sweet person and a gourmet cook, but also an amazing writer, and fantastic photographer. I recently set up an account at WordPress…. I had no ideas you had posted this here. It was so much fun to read again, you two are so talented!!! I loved being part of your comic series. Have you all decided to move forward with a book? Looooove the Terrible Turtle Conspiracy! Yeah, we moved here because 3.0 and the TTTC don’t work together, wo we’ve put it ALL here, LOL!